Sauté the onions in a small pot in the olive oil and sea salt over medium heat until they begin to soften and look glassy. Add the rest of the ingredients and simmer on low for 20 minutes. Remove the bay leaf before serving. Combine all the ingredients in your food processor and pulse until it reaches a crumbly texture. Soak the raw cashews in a bowl of water about an inch over the top of the nuts. Let sit for 1-2 hours. Drain and rinse. Add to a high-powered blender along with all the other ingredients and puree until smooth. You might have to add a little more water if the cheese mixture is too thick. Mix all the ingredients together in a bowl, cover and chill an hour. Mash the ingredients together in a bowl with the back of a fork. Toss the ingredients together in a bowl and spread onto a foil lined baking sheet. Bake in a oven heated to 350 degrees for 5 minutes. Flip the “bacon” and return to the oven for another 5-7 minutes depending on how crisp you would like yours to be. Remove from the oven and let cool. Store in an air tight container. In a large bowl combine the beans, onion, and garlic. Using a potato masher or your hands, lightly smash the beans until they are about 3/4 mashed. Add in the rest of the ingredients and stir well. Form the patties and cook in a lightly greased frying pan on medium-high heat for about 5 minutes on each side or until the sides are golden. 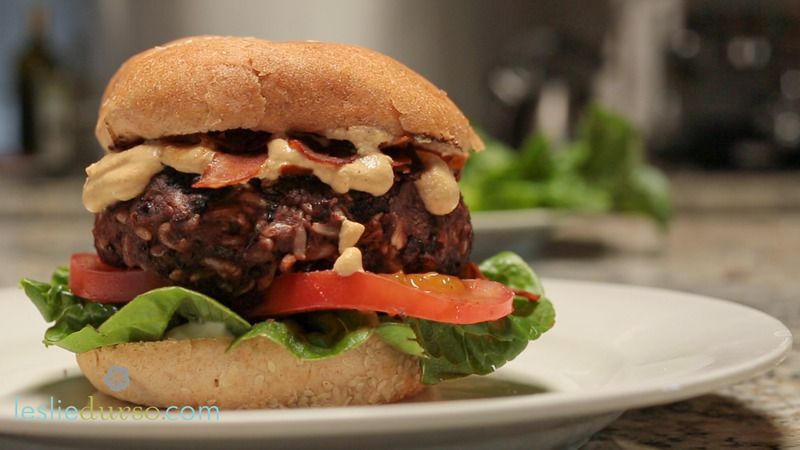 (the key to a cooking a good burger is not to flip it too many times. Let it get a nice golden crust on one side before you flip it to the next.) Serve warm with all the fixins! Cut off any bottom leaves of the cauliflower and cut out the toughest part of the core. Then break the cauliflower down into florets. Boil them with the vegetable broth covered until the cauliflower is very soft and tender. About 15 minutes. While the cauliflower is cooking, heat a large frying pan and sauté the onion and garlic with the olive oil until soft. When both are done, using a slotted spoon, remove all the cauliflower from the broth and place in a blender or food processor. Add 3 cup of the cooking broth, all the contents of the frying pan, the rest of ingredients. Puree on high until very smooth, 1-3 minutes. Add a little more broth at a time if it needs to be thinned. Add salt and pepper to taste. Toss the hot, cooked pasta in with the cheese mixture, adding a little at a time until the pasta is covered with a little extra. 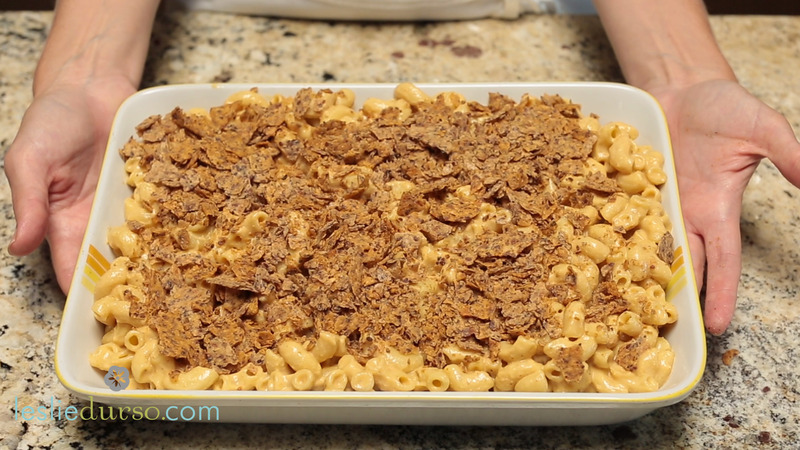 Pour into a baking dish and top with 1/2 cup crumbled nacho chips. Bake for 10 minutes in a heated 400 degree oven. Serve immediately. In a large bowl, cream the sugars, coconut oil, almond milk, applesauce, and vanilla. In a medium bowl, combine the flour, baking soda, and salt. Drop a tbsp. size ball onto a parchment paper lined cookie sheet and bake in a heated 375 degree oven for 10 minutes. Cool on the pan for 1 minute and transfer to a wire rack. Day old cookies that are on the dryer side work best for this recipe so they don’t fall apart. 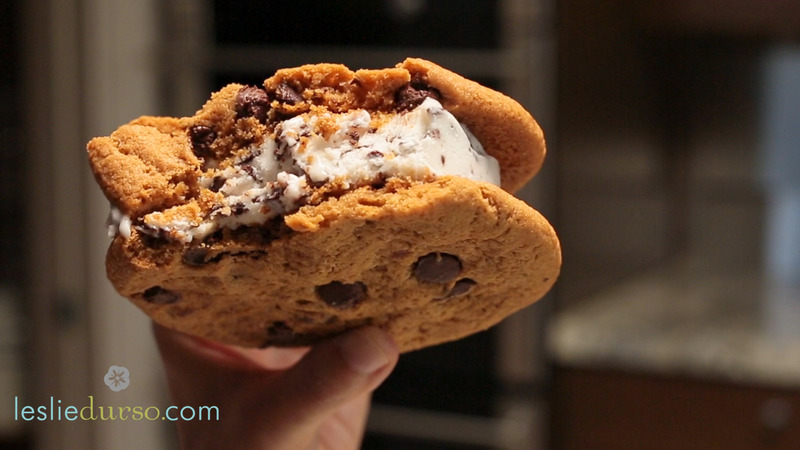 Sandwich a big scoop of ice cream between two cookies and enjoy! Sweet dreams of Vegan Junk Food!! For the Chocolate Chip Cookie Ice Cream Sandwich.If we don’t like Coconut Ice Cream or we are allergic. What Ice Cream do you suggest. How long will the “nacho cheese ” be good for? Hi Nick! The cashew nacho cheese should last 2-3 weeks in your refrigerator. The directions say to make a Tbsp ball of dough and drop on sheet. The finished cookies look like you used much more than a Tbsp. of dough. These recipes are amazing, Leslie! Great video!! Looks like some good stuff! I went vegetarian back in 2007, but I want to go vegan . . . My biggest problem: CHEESE . . . I love the stuff! Any chance you’ll show us a pizza recipe? i tried making the nacho cheese, it turned out like soup 🙁 very upsetting to have to throw it out. I’m not sure what went wrong, i measured everything correctly. Ellen, I’m sorry yours turned out like soup! 🙁 I make it all the time like this. I wish you emailed me before you threw it away. You could have added some dissolved cornstarch to thicken it right back up. Please feel free to reach out when making any of my recipes! i tried making the nacho cheese sauce again tonight, i only had about 1/2 cup of cashews left so i halfed all the ingredients. (except for the water, i only used about 1/4 cup, i also didn’t soak the cashews this time) it turned out much better, i used it as a dip for nachos. ff the cashew cheese sauce is too liquidy? It looks like there is rice in the burger. I have tried similar recipes that call for rice, but noticed this one did not. I’m always looking to try new things, but wanted to make sure I didn’t miss anything! The loaded vegan nachos were delicious! My mother and I loved them, and she couldn’t believe they were vegan. I am so happy to find recipes like these that show people how great vegan food can taste. Thank you so much for posting this! All of your food looks amazing. As someone who loves veggie burgers but is skeptical of the frozen patties at the supermarket I have tried several veggie burger recipes (not yours as of yet). Yours look great! The problem I always run into is my patties are always just a pile of mush. They may taste good but they don’t resemble a burger. Any clue what I might be doing wrong? Thank you for sharing. Hi Jason, If you burgers are turning to mush, try my recipe. Half smashing the beans by hand and adding the oats and veggies really helps you have a “vegetable burger” consistency. If you over mix, most recipes will turn to mush. You can also try baking the patties for 15 minutes first and then finishing them in a frying pan. Let me know how it works! the nacho sauce is way too liquid. I followed this instruction right. How many cookies does the cookie recipe make?? Can’t wait to try the nacho thing! Jesus Christ, the burgers were spicy! If I were to make them again (I don’t think I will, they were completely too spicy), I’d tone down the chilli powder! One tablespoon is way too much. I’d use maybe a tea spoon. Whew! curious– how long will the cheese sauce last in the fridge? I’ve left it in there for 4 days and it was fine. Honestly, I eat it so fast once it’s made, I have never found out how long it lasts! Leslie, I’ve just made the nachos. OMG, how delicious!! Thanks for the recipe! Oh yay! I’m glad you enjoyed! 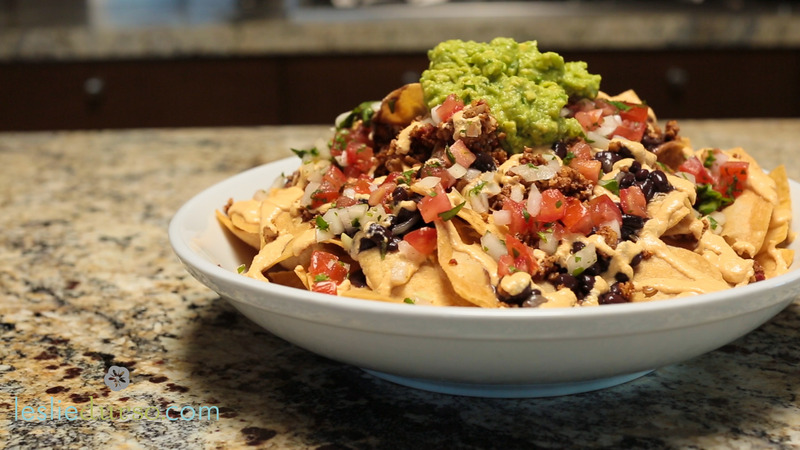 Do you use nutritional yeast flakes or do you use the nutritional yeast seasoning for the nacho cheese sauce? Hey! Those all look delicious! Do you have these recipes in printable format? Thanks so much for the forum topic.Thanks Again. Awesome.